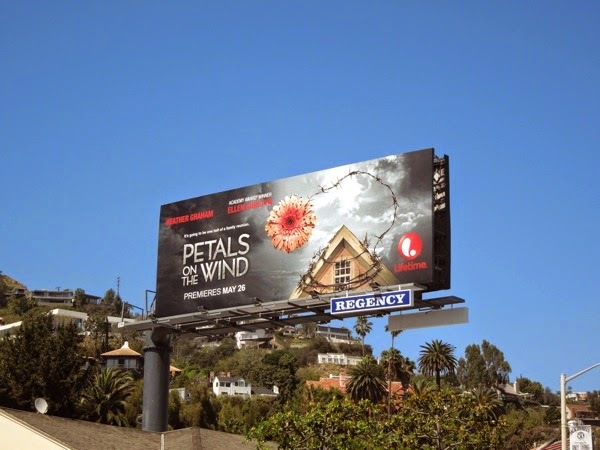 Following the TV ratings success of Lifetime's remake of V. C. Andrews Flowers in the Attic in January earlier this year, it's no surprise that the network fast-tracked the never-before-adapted sequel, Petals on the Wind. 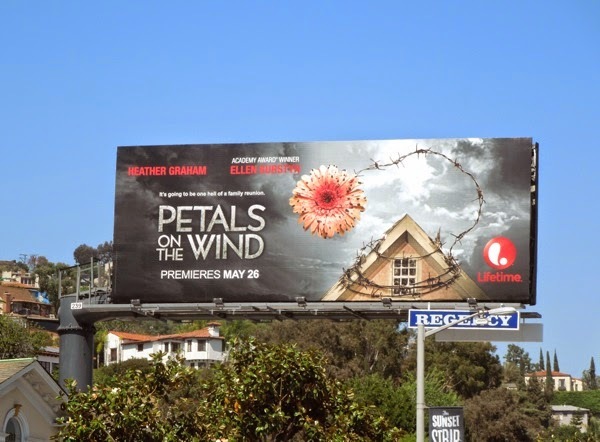 This follow-up originally written in 1980 follows the remaining Dollanganger siblings after their escape from their grandmother's attic prison at Foxworth Hall and the death of their brother from poisoning at the hands of their mother. 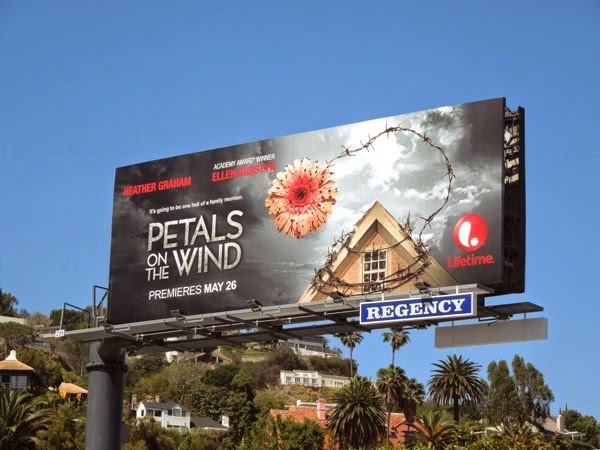 Now a decade later and a grown up 'Cathy' (now played by Rose McIver, recently seen as 'Tinkerbell' in ABC's Once Upon a Time) hatches a plan to get revenge on her mother and grandmother (with Heather Graham and Ellen Burstyn reprising their twisted roles), whilst still pursuing her forbidden relationship with her brother 'Christopher' (now played by Wyatt Nash). 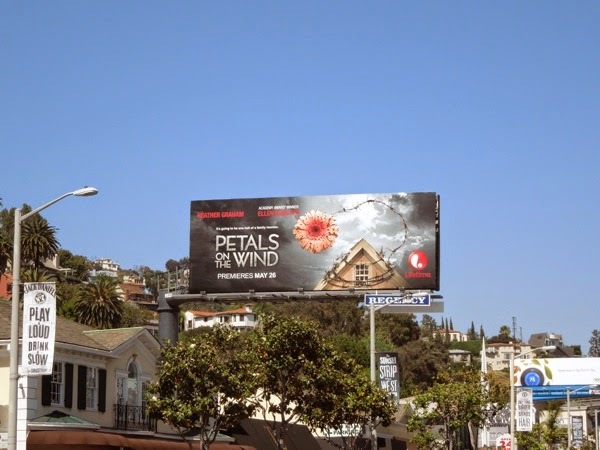 This suitably sinister ad creative for Petals on the Wind with its stormy skies, barb wise and bloody flower was snapped along L.A.'s Sunset Plaza on April 30, 2014. 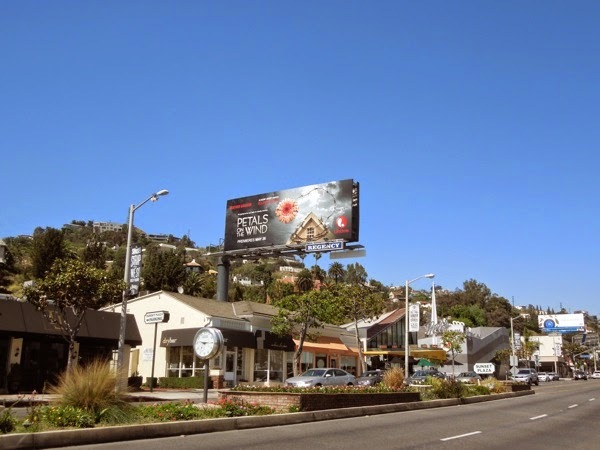 Be sure to also check out these billboards for Flowers in the Attic and if you're a fan of the Dollanganger novels, don't despair, it sounds like more TV movie installments are already in development.